When he was barely eight years-old, Andy’s mom and dad went piano shopping at Grinnell Bros. on Woodward Avenue in downtown Detroit. Black and sleek, the piano was for many years, the only new piece of furniture in their house three miles north of Detroit’s Eight Mile Road border. Andy learned his scales, finger exercises, and beginners' pieces from a German woman who knew her stuff, Mrs. Sara Tittlebaum. Andy's exposure to choral singing was limited. His father was a keen fan of “Mitch Miller and the Gang” LP's which he played on Sunday afternoons. But the family had a housekeeper who brought a different kind of vocal music into their home. She had a wide repertoire of spirituals she sang while ironing in the basement laundry room. Around the age of 11, Andy started to develop film and contact print the negatives, with help from his father in that same basement laundry room. His interest in music and photography really never waned. After college Andy slid into a career as a free-lance photojournalist, and played piano in jazz groups. His national clients included Time Inc. Publications, NEWSWEEK, The N.Y. Times and Getty Images. He also provided photography to Chrysler, General Motors, Toyota, the Meredith Corporation, and Herman Miller. Assignments have taken him across the United States, to Europe, and Japan. 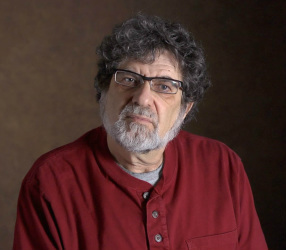 A 1969 graduate of the School of Architecture and Design at the University of Michigan, Andy served on the University’s Board of Student Publications for six years. His work on this film combines decades of experience with lighting, composition, logistics, and getting-to-know-your-subject skills. Q: How do you get people to be frank and candid with you – to have trust and confidence in a man with a lot of camera gear, who usually needs a haircut? A: Tell them who you are, and what you are doing. It works most of the time. Patrick Murphy grew up in northwest Detroit, near the corner of Linwood and Grove. His father, a professor at the University of Detroit, was one of the founders of Detroit Public Television. After graduating from the University of Michigan, Patrick worked as a media producer in the University’s Health System, and then as a manager of Michigan Productions, the University’s largest video production service. He also wrote for the Ann Arbor Observer and served on Ann Arbor’s cable commission. Aside from his video production activities, Patrick also teaches media production and documentary video production in the Digital Media Arts Program at Washtenaw Community College. In 2011 Patrick retired from his administrative position at the University and returned to his primary interests as a freelance media producer. He also joined forces with Andy Sacks, a friend since his undergrad days, in developing a documentary production about the people and the spirit of the city he where grew up, Detroit.